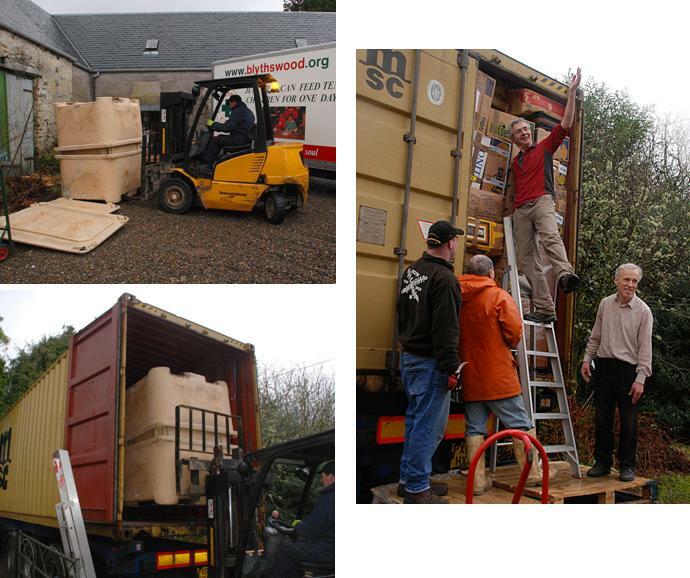 On 9th February, a cold and wet day, Raven Trust volunteers met at the store in Strachur to load the latest container to be sent to Malawi with a large autoclave (steriliser), fish transporting tanks and over 1,000 boxes of assorted goods. The fish transport tanks had been donated and were on their way to John Blyth at Mzuzu University who will use them at orphans’ houses to collect water from roofs to be used by the household. Archd, Fergusson Ltd., a local building contractor, made it possible for us to load these heavy items onto the container by loaning a fork lift and driver. Then it was up to the volunteers to load and pack the rest of the boxes, suitcases and equipment.